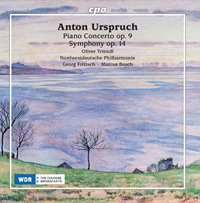 Description: The 43-minute concerto, composed in 1878, has astonishingly little to do with Liszt, given the young Urspruch’s connections with that master, and much to do with Brahms. Although the piano part is properly virtuosic and demands eminent talent on a thoroughly Lisztian level, the ambitiously designed work is actually more a symphony for piano and orchestra. The instrumentation of his symphony (1881) is in principle of classical character and often pleasurably sonorous and also shares a certain predilection for the oboe with its model, and he too combines Beethovenian texture and its frequent shifts of tempo with romantic emotion. The themes are oscillating and reflective, exhibit staying power, and intensify to dramatic upswings. In its 50 minutes length, it manifests an expansive amiability usually the property of older creators and it made me think of a similarly unhurried and arguably overstuffed first symphony - that of Dvořák. 2 CDs for the price of 1. Oliver Triendl (piano), Northwest German Philharmonic; Georg Fritzsch, Marcus Bosch (Symphony).